A model of the White Walker character from HBO’s “Game of Thrones” is displayed at the International “Game of Thrones” exhibition in Stockholm on March 11. 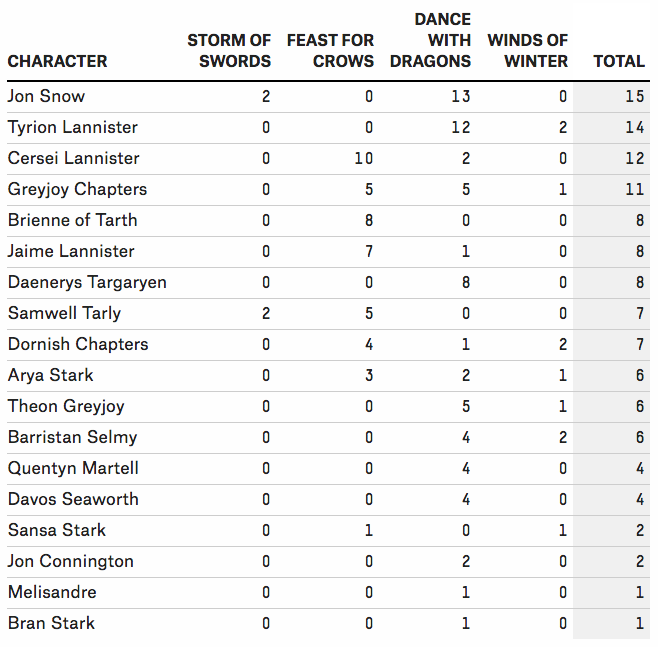 Warning: Spoilers for both the “Game of Thrones” books and show follow. Strap in, everyone, because the fifth season of HBO’s “Game of Thrones” — premiering Sunday — is going off book, and fast. With 10 new episodes in Season 5 and no new books since July 2011, it’s time to take another look at how much source material the HBO showrunners have left to work with. Last year, about halfway through the show’s fourth season, I was struck by how fast the show was blowing through the book material (George R.R. Martin has published five books and is still working on the final two books in the “A Song of Ice and Fire” series). While the show closely tracked with the novels for the first two seasons, the third and fourth seasons — which were ostensibly based on the third novel, the massive “A Storm of Swords” — drew material increasingly from anywhere they damn well pleased. Attempts to get inside Martin’s head are dangerous and cocksure. But some are interpreting the release of completed chapters from the forthcoming sixth book, “The Winds of Winter,” as attempts by the author to stave off getting scooped by HBO on character arcs. Martin uses a framing technique where chapters are told from the perspective of a single character. We can count up these point-of-view chapters, see how many have already been represented on-screen, and see how many are left. Doing this involved some judgment calls; for instance, while HBO has included in the show one element from the first Cersei Lannister chapter in “A Feast for Crows,” the rest of that chapter hasn’t been used yet. I counted that as an untapped chapter, but there are more borderline cases. Spoilers for the novels are about to get heavy now. Martin has now released or read at conventions 10 chapters from “The Winds of Winter” — one each from the point of view of Arya Stark, Sansa Stark, Theon Greyjoy and Victarion Greyjoy and then two chapters each from Arianne Martell, Tyrion Lannister and Barristan Selmy. The most recent of these, a Sansa Stark chapter, doubles the amount of remaining source material available for that character. Here’s the total number of chapters remaining for each point-of-view character. That’s a pretty slim amount of source material remaining for a lot of fan-favorites, including Sansa, Bran and Arya Stark. The good news for fans is that Isaac Hempstead-Wright, who plays Bran Stark, said the character is taking a season off. This will presumably buy time for the producers to figure out what the hell is going to happen with him. More good news: Some characters — Jaime Lannister in particular — are going on off-book adventures this season, leaving the next book unspoiled. And some — Cersei, Tyrion, Jon, Sam, and Daenerys — have lots of material to work from. The bad news: The show will probably burn through the remaining Sansa and Arya chapters quickly this season (maybe Theon’s, too). Martin has told HBO how the series will end. So unless he’s able to crank out a book soon — and the best estimate we have of that says “probably not” — we’re likely to see a lot of spoilers.